This is the flag of the Cairen Empire, which is the founding Empire of the current Historical era in Aristasia Pura and was established some 3,300 years ago. The flag is used by several Eastern Princesses whose realms and monarchies are held to be the direct descendants of Caire. The rays of the sun combine both the orthogonal and the diagonal cross, representing the extension of a world-order in all possible directions of material space, while the governing Celestial principle is represented by the central Sun. This expresses the Imperial ideal: both the early mission of the Cairen Empire to expel the Outlander and establish the Divine Order throughout the Aristasian lands and the later task of unifying and administering the widespread Empire. The heart in the microcosm of the body is the incarnation of the sun in the macrocosm of the universe, and just as the sun supplies the surrounding world with warmth and light necessary for life, so the heart supplies the whole body with its life-blood. Thus the Sun of the Imperial flag is also the Solar Heart of the Empire, and the rays are like the many paths to and from the Holy City of Caire. The saying “All roads lead to Caire” has a clearly metaphysical significance, as does the designation of such roads as “arterial”. The Cairen Imperial Flag represents, at the highest level, Dea as the Supernal Sun at the centre of Her created universe and at the lower or “political” level, the Imperial City providing the lifeblood of the Empire, the maternal nourishment of civilisation and order. One may also note here a reflection of the relation between wisdom and method (often illustrated by the parallel of the blind maid carrying the lame maid — for the blind maid has the material power to walk, being method or substance, and the lame maid has the spiritual power to see, being Wisdom or Essence). The arterial rays transmit the life-light or lifeblood of the Spirit to the Empire, while the arterial roads also bring material support — food, goods, servants etc — to the Capital. The Solar Centre represents the Celestial City at the heart of the Empire, the Temple-Palace at the heart of the city, the Imperial Throne at the heart of the Palace, the Solar Empress, Incarnation of the Sun at the heart of the throne, and the Divine Solar Heart — the essence of her incarnated ancestral divinity — at the centre of the Empress herself. The two colours of the Cairen Imperial Flag represent the two qualities of the sun: light (gold) and warmth (red) which are respectively Wisdom (or Solar Intelligence) and Love, the two Divine Nutrients of the Empire. My name is Nancy Moore and I am a 15 year old blonde from Dovedale in Quirinelle. I live with my parents and my older brunette sister, Estella who is 19 and my younger blonde sister Coco, who’s real name is actually Claudia. She is 10. My family are dairy farmers and we also have a huge orchard containing apple, plum and pear trees and best of all cherry trees which are my favorite as they look so nice all year round and I adore cherries. My family all live close by, I have cousins all within walking distance. Last year my cousins organised a dance in one of the farm’s barns and all the older girls could go along, I wasn’t allowed but I did sneak a look. They had a gramaphone and bunting and a table almost groaning with food! This year Mother says I may go if Estella promises to keep an eye on me. And if I do go I can wear my new dress, it is blue with a cherry print. I have a tree house that used to be Estella’s until she got too old and said it was only for babies, but I love it. Mummy often makes sandwiches and cakes and large bottles of cold lemonade for me and Eliza (my best friend) to take with us and we sit up there for hours on end. Only Eliza is only home over the summer as she attends a boarding school in the eastern Quirrie. Last winter I had a baby cow to look after all by myself which was quite fun. She was born in February, and was such a wee thing and I had to hand feed her and everything. Her name is Honey and she is quite a darling,. She has the loveliest big brown eyes and always comes to me when I call her name. on a mythic significance, in particular the storms which prevented the Spanish Armada’s attack on Britain, and the Divine Wind which scattered the enemies of Japan. Aristasia’s mythic history also turns on the repulsion of an invader by Divine intervention – in our case the defeat of the Outlander by the Sun-Daughter Sai Rayanna. The distinction between “myth” and “history” is a very recent one. It really only became fully formed during the 19th century. The modern “historical consciousness” takes as its axiom that history is a set of “brute facts” that simply “happened”: any attempt of ours to read a hugher or spiritual meaning into them is merely a product of ignorance and superstition. The traditional consciousness, on the contrary has always valued history for what it means. In particular the history of a nation or a people is its validating “story”. The underlying point at issue is: do things happen at random or is there a meaning or pattern underlying them? The modern “scientistic” approach is committed to the hypothesis of randomness. The rest of humanity has always believed that events have meaning and are the outworking of eternal themes in the medium of time. The modern practice of “debunking” traditional mythic-history in the light of supposed “superior knowledge” which is often purely hypothetical or based on circular arguments (“this history is untrue because it postulates miracles and we know miracles don’t happen” – which simply means “they believe in miracles, we don’t; and we know they are wrong because we know we are right”) is simply an attack by the “accidentalist” school upon traditional thought. Such attacks often shows great ferocity and emotionalism because their perpetrators are often very deeply and ideologically opposed to a universe with meaning and symbolism. Aristasians, like all traditional people, draw no distinction between “mythic history” and “factual history” since historical events are merely the outworking of eternal themes in time. If the telling of the story sometimes errs on the side of conveying the fundamental meaning at the expense of the brute fact, that is because the underlying meaning is the more important truth about history. The raw facts are relatively unimportant. One might even say that, in an imperfect world, the facts may sometimes be inaccurate about the truths they are intended to manifest. In such cases it may be our duty to correct them. Aside from the major distinction between being born into an Axial or a non-Axial state, are there differing degrees of opportunity for spiritual progression according to the precise nature of the Axial state one is born into? Hindu texts speak of the rarity of the opportunity for liberation – not only the rarity of the human state itself, but then the rarity of being born into a brahmin family and of having other opportunities for liberation. Applying this to our current situation, one may say that not only the Axial state itself, but the type of society we are born into, the level of intelligence we are born with, our natural propensity for spiritual endeavour; all these are factors determining the level of opportunity we actually possess. And each of these factors is determined by our werde (to use the Aristasian term) or karma. In other words, our level of opportunity is not simply a matter of luck, but is the result of our actions and choices in previous existences. Maid is defined as “she who has the power of choice”. The term “maid” is connected to the words “may” and “might” — “might” in particular being a word that emphasises the close relationship between choice and power — a thing might or might not happen, and one has the might to choose. Among Latin-based words the close relation between potency and potentiality expresses the same thing. So, by definition, even the maid with the least opportunity still possesses some power of spiritual choice, which the animals and other non-Axial beings do not. So take the maid who is born in the Pit — perhaps in a very unpropitious part of the Pit (for example, one with little recognition of God) — and with very little intelligence, so that her ability to criticise the Pit is virtually nil. Even so, she may choose to lead a good life, to do good deeds rather than bad ones; she may turn toward whatever form of God she encounters. All these actions may ensure her not only an Axial birth, but a more propitious one in her next existence. And let us also realise that actions which for another might be downward steps might for her be upward steps. We can never judge the actions of another, nor can we make judgements based on her circumstances. Werde is a subtle and intricate matter, a weaving of many threads, of which we can see only the tips that touch our world. Human beings are the only creatures with an upright posture, and this is because they are the Axial being. When we bow we defer our axiality bringing the upper body nearer to the horizontal in homage to the verticality of another. It is said that certain ancient Estrenne cultures held that blondes – being sacred – could never lose their axiality even relatively, thus they made reverence without inclining themselves toward the horizontal. In later times, of course, most curtseys came to incorporate some degree of inclination, but this is held – by some at least – to be their origin. Incidentally, it is also said that the quasi-upright posture of birds when not in flight betokens their position as winged symbols of angelic powers. Here is my Pit-antidote and it never fails to work. Baking!! I have a small collection of very up-to-date recipes, although any will do to be honest! I put my rather Quirrie-esque pinnie on, take out my scales (with Imperial weights, none of these rather odd metric measures) and away I go. My kitchen activities are often accompanied by up-to-date music, and sometimes my rather tubby kitchen cat will sit and watch me. At the end of half an hour or more (depending on the cake) I am thoroughly racinated and have a lovely cake to eat with a perfect cup of tea. What could be more perfect? Just guess what I got through the Iron Curtain last week: a book of Trentish embroidery patterns! It’s beautiful, with colour plates and detailed instructions. Now I’m working hard to finish my other pieces so I can start on one or two from my new book. Trentish embroidery patterns you say? How lovely they must be! I have a collection of knitting patterns from Quirinelle that I take out and admire from time to time, but I fear I am too clumsy to make anything of. 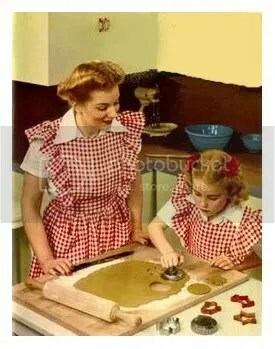 Miss Gladys, I agree with you that baking is wonderfully racinating. Cake is as far beyond this clumsy brunette as are delicate Trentish embroidery and Quirinelle knitting however. Ah, Miss B. – you must not think that you are too clumsy to make anything. It is very naughty of you! Every pette can create something, whether she is skilled in a particular domestic art such as knitting, gardening or baking or in more general things. And you have ‘made’ me feel most welcome, so perhaps your skill in creating is in creating a welcoming environment. That is every bit as important as doing fine work with one’s hands, and possibly more suited to a dashing brunette. What a thing it is to create a civilised atmosphere! I salute you. I am firmly of the opinion that a lot of the problems with bongos are caused by the fact that they do not create, they only consume. Because they do not create, they see no value in permanence and beauty and effort, and praise only the instant and novel. In a sort of vicious circle, because they have been taught impatience and dissatisfaction, they then refuse to spend time on making things of value! They simply purchase an endless succession of cheap, ugly “novelties”, disposing of the things that had caught their eyes (but not their minds or hearts) a moment earlier. It is foolish, rootless and wasteful. This is a subject I am passionate about. Every egg a pette cracks, every stitch she makes, every flower she places in a vase is of utmost importance. Better that a maid should produce a line of wonky stitching or the world’s worst scones (produced, nonetheless, with time and love) than that she should become a rank-and-file consumer. Miss Iris, if all I ever did in this world was make you welcome, I would feel content. Such a wise blonde as you are ought to be made feel how welcome are her words, as well as her lovely self, wheresoever she chooses to favor the brunettes with them. I am most grateful for your salute to my humble part in creating the civilized atmosphere which prevails here. It is perfect for civilized discussion with the lightest spice of – I do not want to say dissent, or disagreement, because never would I dissent or disagree with a blonde. Perhaps I shall say the spice of differing perspective. It is true that the vast majority of bongos spend their sad lives as consumers of the things of which in a sane society they would have a share in the production. However, if all bongos were so, Telluria might look forward to a much swifter return to sanity. The images and noises of the Pit do not arise of themselves. Intelligent and educated bongos are paid quite a lot of money to produce the trash that assaults our precious sensibilities whenever we must venture into the Pit. Bongos of the most powerful class choose to create art of destruction and sickness, and choose to broadcast it to the great world. As you say, “Every egg a pette cracks, every stitch she makes, every flower she places in a vase is of utmost importance.” It is so that the forces of light will triumph over the forces of darkness – but not only because of the stitches made, eggs cracked, and flowers placed to beautify the Hestia, but also because of the ugliness not made, the chaos not succumbed to. When we use our Dea-given powers in the service of light we do not use them in the service of darkness. We choose to create beauty and order and light and love. And as I write, I am eating wonderful lemon bread you inspired me to make! I wish I could share it with all who read these (overly serious!) words. Ah, Pettes. It is to wonderful to travel. It is even Better to return. The warmth and friendship, hip!, here are dear to me. You darlings are the most Wonderful companions a girl could Hope for. I just love you so much. Oh, am I being too overly maudlin? Well, I have Just come from a Champagne Reception for this terrific artist, Marinetti and they served lots of it. Champagne. I do so like Bubbly, hup! “In a hunter’s cabin secluded in a green-blue-gilded forest, two couples sit down at a rough wood table made from trunks of oak. “The brief blood-red twilight lies in agony beneath the enormous bellies of darkness as if under rain-soaked and seemingly liquid whales. “As they wait for the peasant cook, the only food that passes along the still empty table is the whistle that the wind makes through the door lock, to the left of the diners. “Dueling with that whistle is the long, sharp wail of a violin note escaping from the room on the right belonging to the cook’s convalescent brunette daughter. She calls herself a Futurist, hep!, Aeropoet. Need I add that she’s simply the most Intense Brunette I’ve ever met? Barpette, may I have a brimming glass of French Fizzy stuff? Patience and I are just back from a Romantic jaunt to the continent via Zeppelin. Patience knows I love to travel by airship and arranged the Excursion as a surprise. Isn’t she tops? Have I shown you her picture? Wait… I have one in my bag somewhere… Oh, here she is in her new yellow hat. She took me first to Berlin for a week. We attended some Night Spots where the entertainment was certainly Eye Popping. The costumes on the, hip!, girls, well, I don’t consider myself Prudish in the least but I blushed crimson never-the-less. Our next stop was Madrid. The second night, while staying at a lovely villa, we had a dinner of spiced chicken and rice accompanied by a smooth Port. It was there and then that Patience agreed to set a date. Do you know, I nearly Fell off my seat! We have been betrothed now for nearly three years and every time I brought up the subject of setting a date, Patience found some excuse to put it off. First it was her, hoop!, family. Then her work. I love her so deeply that I was willing to wait until eternity. Yet I despaired we would ever Actually marry. And here she was asking if May or June would be alright. Well, I set her straight at once. Anyone knows no wedding can be Properly planned in a month or two. The engraver alone needs three for the invitations. And for my dress, Goodness, I’d need twice that time. Perhaps later I could impose on Miss Anita, our Paramount Studios Archivist, for some suggestions? I’m the luckiest Blonde in the world, hip! At the heart of the question of what Aristasia actually is lies the concept of the World Axis, common to all traditions and integral to the most fundamental traditional symbols, such as the wheel, the pyramid, the fireplace and chimney, the bridge and so forth. The World Axis passes through all levels of being, linking the lower levels to the higher and eventually all to the Divine. In Telluria human beings are the central or Axial beings. Because they are on the Axis, they are capable of rising above their human state or of falling below it. Animals, fairies and other non-axial beings – including “titans” – the inhabitants of temporal paradises – cannot rise or fall; they can only conform to the laws of their particular being. My argument has essentially been that Aristasians, like humans, are Axial beings. Therefore their world is a higher plane of being than ours, situated upwards on the World-Axis. Its superiority is evidenced in the various points brought forward by Miss Lovatt. Telluria, since the patriarchal revolutions of the Iron Age (I use this term as meaning the fourth and lowest point of an Historical Cycle, not in the modern archaeological sense), has been increasingly governed by the masculine principle, traditionally symbolised by the planet Mars. In other words, conflict and discord, as opposed to concord and harmony. Aristasia continues to be governed by the feminine principle, symbolised by Venus – love and concord. Of course, all seven “planetary” principles exist in all worlds and all are necessary – though obviously in Aristasia the Martial or Vikhelic principle is not associated with masculinity, since masculinity does not exist there. This in our view is a greater perfection than that of Telluria. While war and violence have been at the centre of most Tellurian history in its Iron Age, this has not been the case in Aristasia. Aristasia is nonetheless in its own Iron Age, and is less perfect than it was in earlier times, though still much more perfect than Telluria. Do you know the Cottingley fairy photographs? To my mind, one of the fascinating points about them – surprisingly rarely remarked on by critics – is how utterly Vintesse the fairies look. Just take a peek at the darlings. Look at their lovely up-to-date bobs and their perfect Puppenkopf faces. They might have stepped out of any Vintesse fairy-book and almost from a fashion plate of the Province. This raises certain questions. Those doubting the pictures really ought (if they were more sensitive to qualitative rather than merely quantitative matters) to suggest that these clearly came from the imagination of Vintesse girls. Would real fairies present themselves in a manner so clearly influenced by human fashion? My answer is – I think they might. There could be various explanations. 1. In the first place, fairies are not physical creatures. They are not normally visible. When they do take on visible forms, it might well be done with some assistance from the image-sphere of those to whom they are manifesting. 2. Human beings are the central or axial creatures of this world-system. We might well expect more peripheral creatures, who borrow their forms from humanity, to reflect something of the human ways of the time – just as courtly fairies in mediaeval descriptions resemble mediaeval human courts. 3. In historical Vintesse, the Western Islands were in a time of crisis, with the Great Darkness (that eventually eclipsed the culture and became the Pit) still being contested by the Stream of Light, which largely manifested itself in the Art-Neo spirit. Human beings were the main conduit for this spirit, but we need not necessarily assume that they were the only one. Are there other fairy-friends in Aristasia? And what do they think? We are all familiar with the Pit insofar as it refers to late-patriarchal Telluria. But, dear pettes, how many of us have considered why this particular term is used? Aristasians do not use words lightly, and words like Pit are not used arbitrarily. Why, then, do we call late-patriarchal Telluria the Pit? Why not call it simply “Late-Patriarchal Telluria?” And, furthermore, does the Pit mean more than just late-patriarchal Telluria? Dearest fellow Aristasians, I believe I have the answer to at least some of these questions. Let us all think for a moment about pits. What is a pit, in the most “literal” sense? A pit is a deep hole in the earth. Sunlight rarely penetrates, and there is a real danger of falling in. Imagine falling into a pit, particularly if one is walking alone. With broken limbs from the fall, it would be very difficult to climb back out again on one’s own. It would be cold, and one would have no recourse from the elements. Let us all remember, however, that when we fell into the pit, we weren’t, in fact, walking alone. Dea watches over all of us, even (and I might add especially) those trapped in Telluria, and She is eager to extend a luminous hand to those mired in Darkness, so that we might become closer to Her. She, too, can tend our wounds and heal us from our fall, if we only call to Her. I know, dear ones, that ascent from the Pit may seem a perilous task. Here, it is important to remember another thing about pits in general, which I will illustrate with an example. I once knew of a deep, dark hole near my home, and never went near it, for fear of tumbling in. It was very large. Several years later, I returned, and found that years of rain had entirely filled it with water. I no longer feared tumbling into it, knowing that, even if I did, I could easily kick to the edge and escape. Just as water can save a maid from a dark physical pit, Divine Love can save maid from a spiritual pit, by filling her heart and surroundings with buoyancy, lightening her burdens, and carrying her to the edge. Now I come to the other point I wanted to make. When the phrase “the Pit” is used almost always to describe late-patriarchal Telluria, it can be easy to forget that Telluria is not the only pit we need worry about. I am sure there are many. Darkness can manifest in many ways. Note: in this chapter the Aristasian term ‘the Pit’ is used in place of what has elsewhere been called the Tamasic or Inverted post-Eclipse world. It will be seen that the naming of the phenomenon has a certain potency, and the term is both vigorously descriptive and carries an obvious symbolic significance, both directional and in terms of Western iconography. “In terms of Western iconography” presumably refers to the infernal Pit which is rather interesting in view of the possible status of Telluria as a purgatorial or “lower world”. Specifically the “infernal” element here would presumably be the inversion of values that came about with the Eclipse rather than the nature of patriarchal society as a whole. Miss Corinthian’s last paragraph is extremely telling. It is true that wherever there is life there is the conflict between light and darkness, and beings everywhere must be careful to avoid what are so rightly called “pitfalls”. It is by following the Way of Thamë and by the Love of the Mother that we do so. Comments Off on Why the Pit?